Neither of these composers are particularly familiar names, but their pairing on this double SACD hybrid release is an entirely logical one. Franz Tunder succeeded Nicolaus Hasse’s father Peter or Petrus Hasse in the post of organist at St. Mary’s church in Lübeck in 1641. Roughly 10 years senior to Tunder, Nicolaus Hasse received tuition from his father, who in turn is reputed to have been a pupil of Jacob Praetorius whose own musical line can be traced to Sweelinck. Tunder in turn uses Praetorius’ example for his own chorale fantasias. The familiarity in the titles of the pieces shows how both these composers were part of a continuum of tradition which carried through to Buxtehude and J.S. Bach, whose own preludes and choral fantasias represent the pinnacle of baroque church organ music. The quality of the music on these two discs shows how well established were these traditions by the mid 17th century in Germany. Spread over a nicely balanced programme, Tunder’s Preludes share a similar structure and a more archaic harmonic language than many of the chorale fantasias. A short toccata-like introduction is followed by a chorale/chordal sequence, and topped with a four part fugue. The little G minor fragment gets no further than the introduction. These are attractive works nonetheless, and form a sort of foundation for the rest of Tunder’s organ works. The chorale fantasias vary in length and substance, from the relatively brief but delightful Jesus Christus, wahr’ Gottessohn to the remarkable Ein feste Burg ist under Gott on disc 1 which is full of technical echo tricks, and shares similar elaborate counterpoint to both versions of Was kann uns kommen an für Not. The Canzona is an animated little piece showing a lighter, more playful side to Tunder’s character. Nicolaus Hasse’s complete known organ works amount to two arrangements and two chorale fantasias, but he also wrote numerous sacred songs and a miscellany of occasional works. One might expect the older composer to have a more conservative approach and this is indeed the case to a certain extent, but there are plenty of moments in Hasse’s chorale fantasias which approach Tunder’s in quality and stylistic content, the final work topping everything I terms of duration. Of the two versions of Jesus Christus, under Heiland, der von uns den Gotteszorn wandt the first is an arrangement which sets the chorale for full organ, and the second elaborates the cantus firmus in rather choppy segments, but using similar echo effects to some of Tunder’s chorale fantasias. The final Komm, heiliger Geist, Herre Gott is of a similar structure but has a more ambitious scale as well as some nicely quirky rising chromatic passages, and is an impressively virtuoso work with which to close the programme. 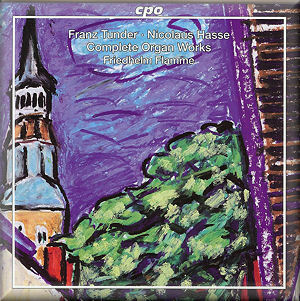 Of the two composers, Tunder is the better known, but recordings of his organ works are hardly thick on the ground, and having them collected here as a complete set supplemented by Nicolaus Hasse is very much a worthwhile addition to the organ catalogue. This release is volume VI in CPO’s Organ Works of the Northern Baroque series, but with clever design this fact is neatly hidden inside the jewel case insert, so that you don’t feel you’re obliged to chase other volumes to complete the set or have to look at fragments of incomplete sets as the titles appear on the shelves. Friedhelm Flamme’s playing is top notch at all times, with a nice sense of flow and rhythm, tempering academic accuracy with a pleasant sense of organic freedom. The SACD effect opens the recording out nicely. Good enough in stereo, the extra sense of space and perceived dynamic width helps with the organ sound fairly significantly. The organ itself is by Christian Vater, and the original instrument dates from 1724 with a restoration dating from 2000. It has a bright, typically baroque sound, but the church has a pleasantly non-swampy acoustic and listening is in no way a hair-shirt authentic experience. This is definitely a recording to be enjoyed, not endured. The 16’ principal bass pipes are particularly impressive, and everything with the instrument is very nicely in proportion and, as you would hope and expect, entirely suited to the repertoire. This set of pieces is a breath of North German fresh air, and will stand proudly in any collection of baroque organ music.